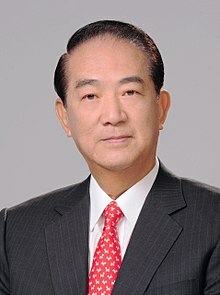 James Soong Chu-yu (Chinese: 宋楚瑜; born 16 March 1942) is a Taiwanese politician. He founded and chairs the People First Party, a smaller party in the Kuomintang (KMT)-led Pan-Blue Coalition. In 1994 Soong was elected and became the only directly elected Governor of Taiwan Province. He was widely perceived to be an excellent campaigner and his excellent showing in the governorship ended hopes by the DPP of a "Yeltsin effect", by which an elected governor would have more legitimacy than the national government, due to the President being still elected by the National Assembly at that time. After Premier Lien Chan was elected vice-president in 1996, the premiership was vacated in 1997 after the Judicial Yuan ruled out that the person could not serve both vice-president and premier. Soong felt that as Governor of Taiwan, he was the natural successor to Lien, but President Lee believed that Soong should serve out his term. President Lee appointed Vincent Siew, whom Soong considered a subordinate, and this act led to the split between Soong and Lee. The position of Governor of Taiwan was eliminated in December 1998 following a National Development Council meeting in 1996, when it suggested that the administrative structure of the Taiwanese government be streamlined. Soong and his supporters believe this to have been a political move by President Lee to cut off Soong's power base, but proponents of the downsizing called it a pragmatic move to eliminate contradictory administrative territory. Soong tendered his resignation on December 31 of the same year, but President Lee did not accept it. After the 2004 Presidential election, Soong actively sought the merger of the KMT and People First Party. However, he ceased doing so after the ROC Legislative Election, 2004. Although the pan-blue coalition did well, the PFP did not, and Soong ended talk of a KMT-PFP merger. In February 2005, he signed a 10 point consensus program with President Chen Shui-Bian which brought heavy criticism to Chen. The possibility of DPP-PFP cooperation ended in May 2005, when Soong visited mainland China to meet with General Secretary Hu Jintao of the Communist Party of China. Initially, Chen stated that Soong was to deliver a secret message to the PRC leadership, but Soong denied this. Beyond sentimental visits, the important political aspect of his tour comes from his visit to Beijing. There, he shook hands with Hu Jintao, General Secretary of the Communist Party of China, and exchanged presents with him; Soong gave Hu a work of glass art from Liuli Gongfang, and received a piece of Jingdezhen porcelain from Hu. Soong was only the second major political figure from Taiwan to ever do so. The carefully scripted red-carpet ceremony was identical to the previous greeting for KMT Chairman Lien Chan. The key out-come of the meeting was the publication of a shared political platform between the Communist Party and Soong's People's First Party. Finally, Soong lectured at Tsinghua University, an echo of Lien's lecture at Peking University four weeks prior. Soong hopes to pursue democracy, not only to show the quality of democracy, but also look forward to the future impact of democracy in mainland China; until that day, to re-integrate into a unified China, so that Chinese people feel dignity, pride and pride. Another trait of PFP's democratic parties is to promote democratic legislative decision-making, so that everyone can participate in the development of democracy. In addition to the "One Chinese Roof", the PFP proposes "cross-strait two seats." The "cross-strait two seats" concept is based on the "one China" premise, to promote cross-strait differences between two seats respectively, the participation of non-political international organizations to ensure Taiwan's 23 million people's living, security, and dignity. ^ Despite Chou's expulsion from the Taiwan Solidarity Union on November 9, 2006, the party could not withdraw their recommendation for Chou under Republic of China's Public Officials Election and Recall Law. She would still contest the elections as a TSU candidate. ^ James Soong was Chairman of the People's First Party at the time of the elections, but entered the elections as an independent. ^ Tedards, Bo (15 March 2000). "The many faces of James Soong". Taipei Times. Retrieved 10 July 2015. ^ "胡錦濤贈宋景德鎮瓷器　宋回贈琉璃工坊創作 (Hu Jintao gives Soong Jingde porcelain; Soong gives Liuli Gongfang creation in return)". Eastern Television News (in Chinese). 2005-05-12. Retrieved 2008-01-11. ^ Mo, Yan-chih (18 October 2006). "Soong declares candidacy for mayor". Taipei Times. Retrieved 11 June 2016. ^ "TSU expels Taipei mayoral candidate". China Post. 10 November 2006. Retrieved 16 January 2015. ^ Shih, Hsiu-chuan (10 December 2006). "Elections 2006: People First Party chairman announces an end to his career". Taipei Times. Retrieved 16 January 2015.